You are currently browsing the tag archive for the ‘swans’ tag. galway, ireland. 13 january 2010. I love birds, but I’ve never been much of a bird photographer – they’re pretty hard to capture. I had a bit of luck the other day, and managed to get these two photos of some of my winged friends. 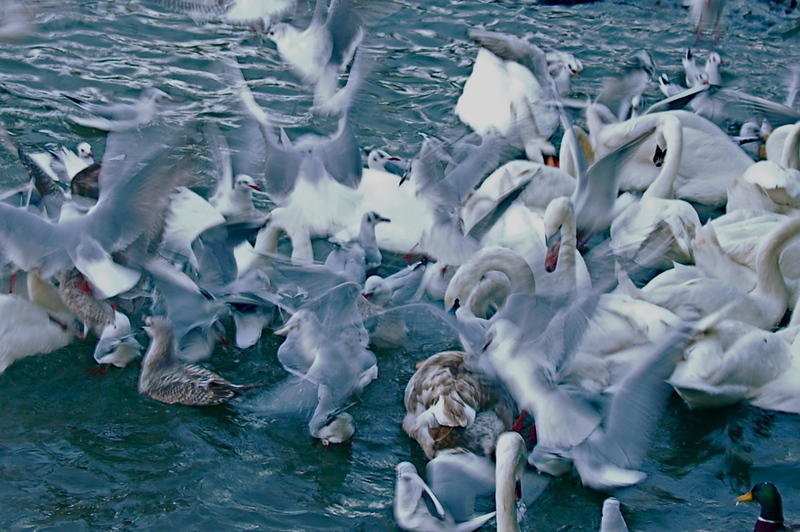 a flurry of wings as seagulls, ducks, and swans are fed by a local Galway resident. Part of my “job” as a Mitchell Scholar is to write quarterly reflections on my experiences in Ireland. Our reflections were published last week. You can read mine, reposted below, and what the other scholars have to say, here. I have a thing for birds. Last year, while living in Uganda, I became obsessed with identifying every weaver, hornbill, and crane that crossed my path. And although the birding is a bit less thrilling here in Ireland, I swoon every time I see a swan gently paddling down the canal that feeds into the River Corrib. 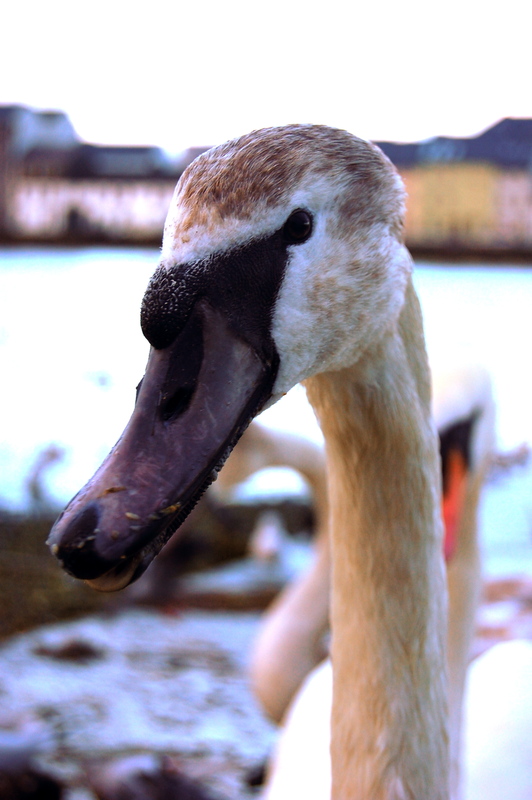 So back in September, when Michael (Mitchell scholar), Jon (my husband), and I stumbled across a flock of 40 (yes, 40) swans while on a walk through the Claddagh, I knew that living in Galway would make me very happy indeed. This year in Galway marks my second year living as an expatriate, and I find myself constantly comparing my life in Kampala to my life here. I’m sure you can imagine the many differences: in Galway, I wash our clothes in a spiffy little machine that resides in the kitchen. In Kampala, laundry was a chore I spent hours doing every week by hand (although, believe it or not, I rather enjoyed it). In Galway, every time the sun shines, I soak it in, because I know it won’t last long. In Kampala, I was constantly seeking out a patch of cool shade. In Galway, the language is English, and I manage to blend in, despite my painfully American accent and fashion sense. In Kampala, I struggled to use my hard-earned Luganda (the local language) correctly and became accustomed to the feeling of being watched. The similarities between my two adopted homes are apparent as well. In both Galway and Kampala, drinking tea is an important social custom, the soccer fans are zealous, and the people are so warm that you are immediately put at ease. Both Kampala and Galway have made their mark on me, and in Galway, I know that the process is still just beginning. Galway, with its twisty cobblestone streets, omnipresent street musicians, and sweet salt air, affords me with somewhat of a fairytale existence. It is easy to while away a day exploring the passageways near my apartment, in the center of the city, window-shopping when the weather is dry and escaping into a café when the rain inevitably begins again. And since Galway is a big tourist city, it’s easy to forget that I’m not actually on vacation; that I’m here to do work. Work is definitely a big part of my life in Galway. Although at times it is frustrating to have my laid-back vacation bubble popped, I am so grateful that my program is turning out to be exactly what I hoped it would be. The MA in Gender, Globalization and Rights is a part of the Global Women’s Studies program at NUI Galway and is introducing me and my 10 classmates to the intricacies of feminist theory, the Bretton Woods institutions, the UN’s Convention on the Elimination of All Forms of Discrimination Against Women, grassroots development methods, and how they are all connected. In other words: more than I bargained for, but in a good way. I am confident that what I’m learning now will be useful in the near future, and that’s a good feeling. Although I love Galway, I have used the majority of my weekends to escape to other places in search of adventure. Traveling throughout the island of Ireland has been a main feature of my travel thus far, and I’ve spent time in Belfast, Cork, and Dublin with the Mitchells. In fact, tomorrow I’m taking a day trip to Limerick to learn more about Irish Aid and to pay a visit to Shane. I’ve also had the chance to visit London with friends from home, and Bremen, Germany, with Irish friends, Michael, and Jon. All of the travel has given me an excuse to improve my photography, a hobby I’ve kept up since my Uncle Cliff taught me how to use a darkroom in the fifth grade. Meanwhile, I am watching Jon and myself become more and more Irish as the days go by. Jon is starting to add “like” at the end of his sentences. I prefer “Dja know?” as it is awfully close to the old Minnesotan saying, “Dontcha know?” I’ve stopped complaining about the rain and started drinking tea several times a day. The familiar process of acquiring the idiosyncrasies of a place is beginning to happen to me once again. I can’t write a about my first couple of months without mentioning my fellow Mitchell Scholars. So many words come to mind when I think of the group: energetic, social, well-read, empathetic, hilarious, loyal, open-minded. I’ve already had so much fun with the group, as well as with people one-on-one, that it’s exciting to think that we have much more in store this year. I feel especially lucky to have Michael in Galway with me, to share the joys of our Mitchell year, and look forward to having Rebekah join us here in January. To my fellow scholars: Here’s to many more weekends where we all sleep on the floor, meals that are cooked communally, days exploring whatever locale we end up in, and nights dancing to a certain Black Eyed Peas song. I think it’s pretty clear that my life in Galway, and in Ireland more generally, is turning out to be pretty fantastic. Between the traveling, the perfection that is Galway, the Mitchell scholars, and my program, I’ve basically got it all. It is truly humbling to be a member of the Mitchell class of ’10, and I’m so grateful for this incredible opportunity. But the cherry on top has got to be this: a flock of swans lives less than a kilometer from my front door. Welcome to our blog! Follow along with us as we travel and experience life as a couple of 20-somethings - with all its ups and downs. We hope to post photos, short videos, stories about our daily life and not-so-daily adventures, and thoughts on what’s going on in the world.